Women have never had an easy time as jazz instrumentalists. The stresses of leading a band, the difficulties of life on the road, the competitive nature of soloing and not least, the time away from family all add up to a life that relatively few women want to endure. For these reasons and others there aren’t many women who have had long-term careers playing jazz. But one woman’s short career didn’t stop her from becoming a legend still talked about in jazz circles to this day. Born in Leipzig Germany in 1925, Jutta Hipp (the first name is pronounced YOU-ta) took up piano at age nine. After studying art at Leipzig Academy of Fine Art, she was initially more interested in painting and graphic arts than music. At the end of World War II, when the occupying Russians wanted her to design propaganda posters, she left East Germany and eventually became a professional musician; playing in circuses and later nightclubs in West Germany during the post war years. With her own group, Hipp became one of Europe’s best and best-known jazz musicians in the early 1950s. When a friend sent some of her German recordings to jazz critic and producer Leonard Feather, Feather arranged for Hipp to come to New York. In Manhattan, Jutta Hipp quickly established herself with a six-month engagement at the famous Hickory House jazz club. She was immediately signed by Blue Note, where in 1956 she made three excellent LPs in rapid succession. Strangely, after such a strong start to her U.S. career, Jutta Hipp disappeared from the jazz scene and was literally never heard from again. This disappearance and the subsequent lack of available recordings make the discovery of several German radio recordings from the early 1950s a welcome event. 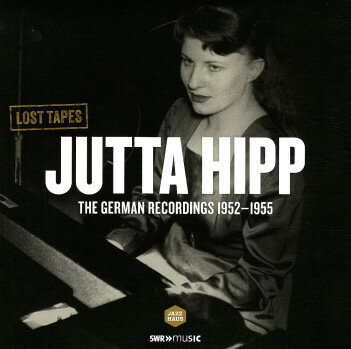 The album, Jutta Hipp – Lost Tapes, Germany 1952-1955 (Jazzhaus101-723) draws on three separate broadcast sessions dating from the time of her first German recordings until the time she left Germany for New York. These extremely rare recordings show Hipp developing a similar approach to that of pianist and teacher Lennie Tristano. As she had not yet visited the U.S., she could not have studied under him, or heard him live; yet the similarities are there. While it’s possible that she may have absorbed some of Tristano’s style from his early records, perhaps they were working independently on the same things. Nevertheless, Hipp made the style her own. There are also strong solo and piano trio performances such as “Blues After Hours,” “Indian Summer” and “Everything Happens to Me” which show that Leonard Feather and Blue Note knew exactly what she was capable of. Over the decades, Jutta Hipps’ Blue Note albums continued to sell, mostly in Japan and Europe, but Blue Note could not pay her any royalties because nobody knew if she was still alive or where she lived. In 2000, she was finally discovered living in Queens, New York, where she had made her living for the previous forty years as a seamstress. It was stated at the time that she had not played the piano since leaving the jazz world in 1956. At the time of her death in 2003, friends said that Jutta Hipp had stopped playing piano because she lacked the self-confidence necessary to perform. As this CD and her Blue Note albums prove, she needn’t have worried.